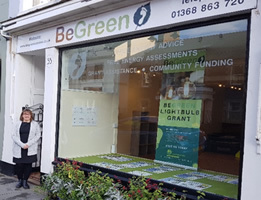 The BeGreen Dunbar Energy Advice Centre, which opened in November 2008, receives funding from Aikengall Community Wind Farm which is owned by Community Windpower Ltd. Located on the High Street in the centre of Dunbar, Anouska Woods is employed as our Community Coordinator. Appointments may be arranged outside these hours by contacting Anouska directly. Aikengall Community Wind Farm provides power for around 33,371 homes. Aikengall Community Wind Farm displaces around 54,241 tonnes of carbon dioxide per annum.